Weights and Measures Regulations , NAWDS & the National Technical Training Bulk-Weigher Training Module. The following procedure is applicable to hopper scale installations commonly known as bulk-weighers with a capacity of 15 tonnes (15 000 kilograms) or less, used to weigh granular product such as those typically found in grain elevators, feed mills or grain cleaning facilities. The procedure is also valid for bulk-weighers with a capacity exceeding 15 tonnes (15 000 kilograms). As product testing of larger bulk-weighers, typically installed at grain terminal and transfer elevators, is not always feasible, the inspector should consult with the Regional Gravimetric Specialist, who in discussion with the Canadian Grain Commission, CGC, (if applicable), will decide if a product test must be performed or not. In a typical grain elevator, one or more front pits connect to an elevating leg either directly or by drag conveyor. Another drag conveyor connects the elevating leg to a sampler and to the distributor. The distributor connects to the upper and lower garners. A scale sits between the upper and lower garners to weigh the grain as it flows from the upper to the lower garner. From the lower garner, the grain is discharged into the back pit. Sensors are placed at the gates of the front and back pit, the discharge points of the drag conveyors, the elevating leg, the feed gates of the distributor, upper garner and scale, points near the top of the scale and garners as well as in the sampler. The hopper scale is a relatively simple device which by itself would be very easy to inspect, except for its location. In most bulk-weighing systems, product travels a protracted path from the front receiving pit to the hopper scale (receiving system) or from the hopper scale to the loading spout (shipping system) encountering many possible product diversions along the way. The inspection of a bulk-weighing system requires a thorough knowledge of the entire system and includes tests for verifying the accuracy of the scale itself as well as the testing of all the required interlocks to verify the integrity of the overall receiving and/or shipping transaction. Furthermore, it should be noted that virtually all bulk-weighing systems are different as are the facilities in which they are installed. For this reason, the following tests may have to be adapted for your particular installation. Refer to Figure 1 — Typical Grain Elevator Installation. In its simplest form, a bulk-weighing system designed for receiving or shipping of a granular product consists of a receiving pit, elevating system, distributor, upper and lower garners, scale and control system. In a typical trade transaction, grain or other granular product is received through a front pit, transferred via a drag conveyor or directly input to an elevating leg. The elevating leg elevates the product and then deposits it in either a distributor or directly into the upper garner where it flows by gravity to the scale for weighing in successive drafts without operator intervention. Interlocks, normally position sensing devices, are placed at strategic points to ensure that all product goes where it is intended to go and to prevent possible product loss or diversion. In most bulk-weighing applications, the hopper scale and indicator are approved as non-automatic devices. Since most bulk-weighing installations are unique to their location and specific use, each controller must be equipped with software that is specifically designed for that installation. Therefore it stands to reason that the dynamic functioning of every bulk-weighing system must be approved and tested on site. This document combines both static as well as dynamic test procedures. The static tests have been extracted from the Field Inspection Manual for Non-Automatic Weighing Devices and are conducted using local standards. Dynamic testing is done with a net known product test load (product test) which allows an inspector to evaluate a bulk-weighing system's= dynamic capability. The product test simulates an actual trade transaction from the point of delivery to the point of weighment or vice-versa. The product test is extremely useful for evaluating a bulk-weighing system's totalizing capability as well as for identifying product loss due to leaks or diversions. This test also identifies potential problems with the scale while in automatic operation that may not have been obvious during static testing. By using a combination of both static and dynamic testing, an inspector can confidently determine if a bulk-weighing system is capable of accurately weighing all product that is being received or shipped. Prior to testing, determine if the system is to be used for receiving, shipping or both. The inspector must thoroughly understand the product flow path and where the pertinent interlocks are located. This information is critical in customizing the tests for each specific installation. Some systems allow for manual operation without using the bulk-weighing control system. If the system can be operated manually, all the interlocks must still be operational or it should not be possible to initiate a receiving transaction. Determine if the system can be switched from automatic to manual during a transaction. If this can occur, product can be lost; this feature must be locked out when you are in the automatic receiving mode. Tare and automatic zero maintenance features are not appropriate for these installations and must be disabled. It should be noted that some systems cannot handle negative weight indications and have been allowed to have a slight positive zero offset to prevent the occurrence of a negative weight indication (i.e. with the scale empty, the primary indicator is set to a positive weight value). In these cases, net weight is calculated as gross weight minus the zero offset. If part of the live load, the hydraulic cylinders should be double ended to ensure that no hydraulic fluid is displaced during the lifting process. The hydraulic cylinders must be free floating and not be resting on or otherwise touching the test standards when the weights are in the normal unloaded position. Ensure that you start with a true zero indication. The test standards, when raised, must remain free of and not bind on a support structure. The hydraulic cylinders must raise the test standards sufficiently to clear the base they are located on. Hydraulic hoses may cause a binding error when weights are raised and may contribute to a false zero when they are lowered. The inspector shall walk the entire product path and where portions of the system are visible, check for product leaks — pay particular attention near gates and diverters. The feed gate (upper garner gate) and the scale discharge gates must also be checked to determine that they are indeed fully closed and not allowing product to leak when closed by the control system. Ensure that the gates are in the correct position as indicated by the controller. It may be necessary to conduct a product test to verify that these gates close completely. Although a bulk weighing system (DTWS) is considered as an automatic weighing system, the hopper scale is tested using the static test procedures common to all non-automatic hopper scales. See static testing below for more information. The bulk weighing system is then assessed for proper operation using the dynamic test procedures outlined below. The Device Under Test (DUT) must be tested with local standards in the static mode using the STP/IPO's from the Specifications Relating to Non-Automatic Weighing Devices (SRNAWD) . Tolerances for static testing are those outlined in the Weights and Measures Regulations applicable to automatic weighing devices. The following requirements are in addition to those tests. The hopper scale shall be tested as for any static hopper scale using the NAWDS STPs. However, remember that the applicable tolerances are for automatic devices from the regulations and not the same as those applicable to true non-automatic devices. Once it is determined that a bulk-weigher meets static requirements, its dynamic capability can be assessed. The dynamic portion of the testing analyses the bulk-weigher's totalizing capability as well as verifying the systems integrity when subjected to a known product test load. In essence this testing is designed to simulate an actual trade transaction ensuring product received or delivered is within the applicable commodity limits of error. The product test is the primary method of dynamic testing. By introducing a known product test load into a bulk‑weighing system we are able to identify operational problems with the system where no other means of testing can achieve the same result. A product test is especially useful for locating leaky gates or product diverters thus ensuring that all product that should be weighed has actually been weighed. If a system fails to meet the limit of error established for this test, further investigation is necessary to determine the cause of the discrepancy. At no time should the results of a product test be used to calibrate the weighing system. Most interlocks and sensors will be tested during the product test. It is important that the inspector identify and locate all sensors and interlocks prior to initiating the product test. The inspector must understand what position each sensor, gate or interlock needs to be in for proper operation of the system and will attempt to change these settings during testing to ensure the system responds appropriately. Interlock testing is normally done through the manipulation of the operator control panel or software; therefore it is recommended that on-site staff, familiar with the bulk-weigher operation, be present for this testing. In addition to these sensors, there are specific requirements for some of the common equipment that is present in a typical bulk weighing system. The upper garner feed gate and the scale discharge gate must not be open at the same time as this would allow product to bypass the scale. Using the controller, initiate a transaction and then attempt to open the scale discharge gate while the upper garner feed gate is still open. The request must be rejected. Attempt to open both the upper garner gate and the scale discharge gate at anytime during the transaction. Since this would allow product to flow past the scale without being weighed, the request must be rejected. Most bulk‑weighers limit the filling of the hopper scale based on programmed draft size (weight) and/or high level sensors. The draft size is configured in the controller and may be specific to the product type being weighed. The high level sensor is placed in the hopper scale at a point where it will activate when the scale is almost full, but before product can spill or touch the upper garner feed gate. The control system continuously monitors this sensor and when the sensor is activated, closes the upper garner feed gate to stop additional product from flowing into the scale which could result in an overflow and product loss. the upper garner feed gate will open and the next draft will begin. Other potential sequences may be allowed providing they safeguard the accurate and complete measurement of the product. initiate a transaction and begin running product through the system; the high level sensor should be activated and stop product flow before any is lost due to overfilling the scale. Note: The action of closing the upper garner feed gate is not instantaneous and some product will continue to flow after the sensor has been activated but before the gate can be closed completely. As a result, the hopper will continue to fill for some period after the sensor has been activated. Therefore the weigh hopper's high level sensor must be located so as to leave enough room to catch all the grain that may escape past the gates after the order to close the gate has been issued by the control system. The quantity of grain escaping past the gates will not be great if the gates are closed at the end of a normal cyclic draft if the preset draft size has been set correctly for the product being weighed. There is a second method of testing this function. This can be tested by filling the weigh hopper to about 75% of the draft size and then pausing the system (if so equipped). On systems with automatic front pit gates or drag conveyors, these will respectively either automatically close or stop. On systems with manual pit gates, these will have to be manually closed. The amount of grain left in transit in the leg will empty into the upper garner (surge bin). Once this has completed, resume operation. The upper garner feed gate will open and flood the scale with grain at a high rate. If the high level sensor is set correctly, the upper garner feed gate will again close and the weigh hopper will not overfill and spill grain overboard. If the high level sensor is placed too high in the scale it may allow product to contact the feed gate. Often when this occurs, motion will detected in the scale and the system will not continue. However, if the scale does weigh, print and discharge the product, the weight registration will probably be erroneous and some of the grain may have spilled over the side of the weigh hopper. This situation may be detected through a product test. There may be a high level sensor which the upper garner to signal to the control system that the upper garner is full and the flow of product must be stopped. Closing the front pit gate (receiving operation). Closing the supply bin gate (shipping operation). Stopping the upper and/or lower drag conveyor in systems incorporating a drag conveyor. Stopping the elevating leg (warning: The leg must be running empty before trying to stop it). Warning the operator that a manual pit gate must be closed. Spilling excess product through a spill pipe back to the front receiving pit. Closing access to the upper garner and allowing product to "back-leg". This product must return to the front pit to be reweighed and must not be diverted to another location where it will be lost from the accumulated net weight for the transaction. In all cases, the upper garner high level sensor must be positioned appropriately to ensure that any remaining product in the system can be captured before spilling and being lost. This includes allowance for product remaining in the leg when the front drag or gate is the control method. Legs should not normally be stopped while they still contain product as it may be impossible to restart them without manually removing the product. Therefore, the leg will generally continue to run until it is empty even after a high level signal from the upper garner high level sensor has been received. If the system includes a distributor capable of diverting product away from the upper garner and scale being used for the transaction, the distributor must be interlocked to prevent product diversion during operation. Attempt to divert product during a transaction by moving the distributor. It should not be possible. the flapper may not change position once a transaction has begun. This may be achieved by disarming the flapper control solenoid or motor or including a solenoid and pin to mechanically lock the valve during a transaction. Attempt to move the flapper during a transaction. It should not be possible. DTWS receiving installations typically receive product from the customer through the front pit. It is important that all received product is accounted for (weighed) and is not diverted elsewhere. The pits will have gates to control product flow. These gates may be automatic or manually operated. The system should not be able to complete a transaction until all received product has been accounted for. Therefore, a transaction may not be completed with the front pit gate closed or if there is product remaining in the pit. The system must first determine that there is no more product in the product path and the front pit gate must be open before the transaction can be completed. Put the system into the receive mode and use the controls to attempt to open the back pit gate. You should not be able to open it in the receive mode. Opening the back pit gate should not allow product to flow into the front pit. A check of the interlocks on a manual pit gate can be performed by opening the back pit gate and attempting to put the system into the receiving mode. It must not be possible to initiate a receiving transaction with the back pit gate open. Opening the back pit gate should not allow product to flow into the front pit. With the back pit gate closed, put the system into the receiving mode and then open the back pit gate. The system should shut itself down. Some elevators will have a boot auger which is used to clean out the boot if the leg plugs up with grain and will not start. Traditionally, the boot auger moves the grain to the back pit; however, when a bulk-weighing system is installed and it is in the receive mode, the boot auger must move the grain to the front pit only. If the boot auger only moves grain to the back pit, then it must be disabled in the receive mode. The grain sampler takes a portion of the grain being received to determine the grade of the grain and the amount of dockage. It can be of either a manual or automatic type. Usually a sampler will take an insignificant amount of product. However, a product test is the only way of confirming this. If an adjustable automatic sampler is used it should be tested at highest sampling rate or interlocked so no product can be taken without being weighed. The control system software must ensure that there is no product left anywhere in the system, between the receiving pit and the scale, before finalizing the current transaction and again before initiating a new transaction. There could be product remaining in the leg if it was stopped prematurely when it was last used. There could also be product left in the upper garner from the last transaction, in the case of a shipping or transfer operation, at the end of which the system was not cleaned. The front pit must be empty — this can be checked by means of a sensor in the front pit or a switch that indicates that the pit gate is open, or by a query from the control system followed by a visual inspection and confirmation by the operator that the pit is empty. The leg must be empty — this can be checked by means of a sensor in the leg or by query from the control system followed by a visual inspection and confirmation by the operator that the leg is empty. The drag is running empty — this can be checked by means of a product sensor at the discharge of the drag. The upper garner must be empty — a sensor indicating that the feed gate is open and monitored to ensure that it remains open for a period of time after the leg is empty and/or by monitoring the absence of motion of the weigh hopper. The weigh hopper must be empty — the control system must verify that the upper garner gate is in the open position and that weight registration is either at zero or at the pre-established "zero offset" reading (this may be as high as 10 kg). Note: An empty product path may also be verified by establishing that the pit and upper garner gates are open, the scale is empty or in a zero or start condition and the leg and drags are running empty for a period of time long enough to clear any remaining product from the system. Stop the leg and attempt to finalize the transaction. You should not be able to complete the transaction with the leg shut off. (Do not stop the leg if it still contains product as it may not be possible to restart it while loaded). 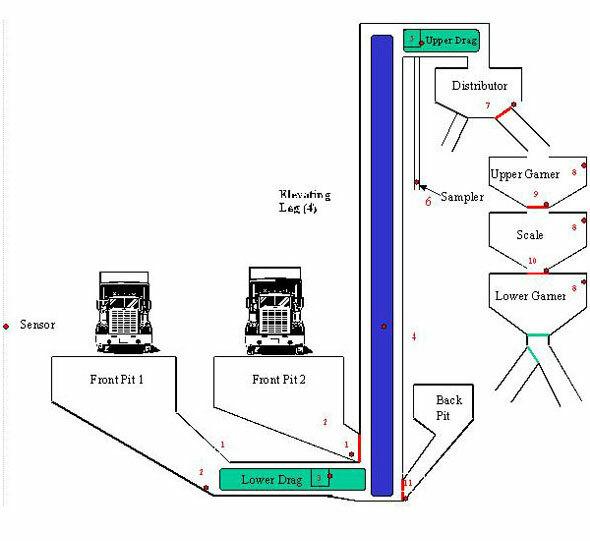 With the leg running close the pit or hopper gates and/or stop drags in any combination so there is not a continuous feed path of product from the front pit to the scale and attempt to complete the transaction. You should not be able to complete the transaction while the product path is blocked by any means. If feasible, trip a product sensor to indicate that the system still contains product. You should not be able to complete transaction with a sensor indicating product remaining in the system. A printed ticket shall contain the net weight received or shipped. Information pertaining to individual drafts need not be printed; however it must be accessible for inspection purposes and must not be lost in the event of a power failure or malfunction. In the event that there should be a power failure while the system is in operation, there must be safeguards in the system to ensure that no product is lost. Prior to proceeding with the power failure test, the inspector must ensure that a loss of power will not adversely affect any other computer systems or equipment in the elevator. While the system is in the receiving mode, interrupt the line power to the controller's UPS. If there is no controller UPS then interrupt the power to the controller directly. If a UPS can keep the controller in operation during a power failure, it is sufficient to meet the requirements of this test. The power failure should occur when both the front pit and scale have product in them and the leg is empty. This can be accomplished by closing the front pit gate during the transaction. The printed ticket should contain the transaction information up to the point of the power failure. After you believe anything that would normally happen has taken place (including computer time out), turn on the power, recover all remaining product and complete the transaction. Some systems run manually while others hold memory. All product must be accounted for. Note: Do not cut power to the system if the leg contains product. For systems not capable of storing printed information, an additional power failure test consisting of interrupting the power only to the printer should be conducted. This should be done at this so-called "critical moment". The control system should be capable of verifying whether or not the information sent to the printer has effectively been printed. Note: The power failure test is only done at the time of initial inspection. The first step in performing a product test consists of developing a suitable known test load. See Appendix A for details. At least three (3) successful product tests must be done each of which must be within the applicable limit of error (LOE) in order to certify a bulk-weighing system. Any equipment or accessories used in conjunction with the bulk-weigher such as a dust collection system must be activated for the duration of product testing. The scale gate could be leaking, allowing product to bypass the scale. The feed gate could be leaking allowing product into the scale as it is being discharged, again allowing product to bypass the scale. To check if product is being diverted. The grain sampler could be taking too large a sample. To check if the flow controls in the controller's software are correct. There could be a faulty load cell; as you are often unable to conduct a comer test of a hopper scale, the product test will evaluate if any off center loading results in measurement errors. Once a suitable load has been developed, the bulk-weigher is put into the receiving mode to begin the product test. The system's controller may prompt the operator to enter the customer's name, the type of product and other supplementary information. Once this has been entered, product may be delivered into the front receiving pit. At anytime during delivery, the inspector may use the control panel and attempt to move the distributor, reposition any diverters, open and close any gates or otherwise attempt to manipulate the system in a manner which could divert product away from the scale. All these functions should be interlocked so that the control panel is not active. Furthermore, the diverters, distributors and gates which can divert product away from the scale should be locked in position to prevent inadvertent or fraudulent manual operation. If they are not locked into position, attempting to move any of them should shut the system down automatically without the loss of product. During the delivery, the inspector should attempt to complete the transaction after having blocked the feed path (i.e. by turning off the leg when empty, by closing the front pit gate, by turning off the drag conveyor, etc.). While the feed path is blocked, it must not be possible to complete the receiving transaction. Attempting to complete the transaction may cause the feed path to open automatically and check for an empty system or it may just wait for the path to be cleared. Before the system can complete the transaction, it must establish that the system is empty of product. Normally, during the last draft of the transaction, the remaining product that accumulates in the weigh hopper is not enough to reach the preset draft cutoff weight. Some control systems will sense this and prompt the operator to complete the transaction. A transaction cannot be completed automatically and must be initiated be an operator. As long as the system is truly empty, the operator should now be able to finalize the transaction. A product test may not be necessary depending on the complexity of the system. Consult your regional gravimetric specialist to determine the need for a product test on a shipping system. If a product test is deemed necessary, it will be necessary to adapt the test procedure for receiving operation. Shipping systems used exclusively for rail freight weight determination are to be marked "Not For Use In Trade" and do not require certification. Once the transaction has been completed and the total net weight of product has been determined and printed by the system, the weight should be compared to the expected net weight of the product used. The total weight of the product as recorded by the bulk-weigher must agree with the known test load within the applicable commodity limit of error of ± 0.15% of the known product test load weight. If it does not agree within the limit of error and the reason for the discrepancy cannot be found and corrected, the system cannot be verified for receiving. When creating a product test load, we recommend the use of a scale with a graduation at least four times smaller than that of the device under test. In this case, the readings from the reference scale may be used directly accounting only for any inherent error in the scale. In the event that such a scale is not available, the following procedure using a certified vehicle scale (d≤10 kg) may be used. Under no circumstances should a product test load be developed on a scale that does not meet legislative requirements. Test truck and 10 000 kg test standards. Suitable vehicle equipped with a dump box capable of holding at least 10 tonne of product. Product used for testing should be the same as or similar to the product intended to be weighed on the system. Certifiable vehicle scale located close to the bulk weigher so that fuel and accumulated debris do not affect established product test load values. If using break points to read the reference scale to finer that 1d, please consult the Break Point Determination test procedure in the NAWDS FIM Preparation, Appendix III. The reference scale should be tested using known test standards and any inherent measurement error at the intended weighing range must be eliminated or noted and considered during further testing. Repeatability testing on the vehicle scale should be conducted using a loaded truck or weight truck approximating the weight of the loaded truck. Zero the scale and place the truck on the portion of the scale that will be used to develop the product test load; preferably under a loading spout or at the receiving pit opening. At this point it is desirable to leave enough room behind the truck for adding 10 000 kg test standards in the next step. Mark the axle locations to facilitate returning the truck to the same position on the reference scale. Determine the exact weight of the truck (using error weights as appropriate). Remove the truck from the reference scale, zero and repeat this test two more times, ensuring the truck is placed in the previously marked location each time. In order to use this scale for development of a product test load, the difference between results must not exceed 5 kg. Difference between highest and lowest reading is 23 018 kg − 23 014 kg = 4 kg, therefore the scale meets repeatability requirement. The product test load should be at least 10 000 kg or the equivalent of 3 hopper drafts, which ever is greater. The bulk-weighing system must be capable of meeting the commodity limit of error of 0.15% for each test and for a minimum of 3 consecutive tests. Therefore, the DUT must indicate a net weight of product somewhere between 9942.08 kg and 9971.96 kg. Round off all values to no less than dDUT. Simplify procedure and group relevant sections. Provide references for procedures addressed elsewhere (e.g. break point). Base product test on commodity LOE. Identify product test as system compliance test. Ensure calibration is not based on product test.